Sauerkraut and Gout is aimed at Gout Foodies. It explains facts about sauerkraut. And, investigates if it can have any effect on gout. Gout Foodies are a type of gout sufferer who thinks that random food changes might improve their uric acid levels. Are you that type of gout sufferer? If not, please look for information that is more relevant to your gout. Starting at Questions for Gout Sufferers. There are many different food products called sauerkraut. And, traditional handmade sauerkraut will vary enormously in its nutrients. But, here, we are looking at properly fermented food, with healthy bacteria, often called probiotic. As such, it is more than pickled cabbage. Many Gout Foodies are obsessed with purines in sauerkraut. Vegetable purines are never an important gout fact. But, to satisfy your appetite for purine numbers, here are some facts from my list of Foods High in Uric Acid. Let’s say a typical serving size is 150g, which is around a cupful. The purine count is a very low 24. Much more important than vegetable purines, we need to consider calories and kidney acid load. There are only around 30 calories in our typical serving of sauerkraut. The science of acid load can be complicated. But, the simple view from Foodary’s Acid-Alkaline Vegetables Food Chart is that 150g of sauerkraut has a PRAL score of -5. So, sauerkraut can help in a balanced alkaline diet for gout. Is Sauerkraut Good For Gout? Recently, there have been some claims that sauerkraut is good for gout. I believe these started mainly from a study that revealed a decrease in uric acid from Chinese sauerkraut. But, that was not a gout nutrition study on humans. It was an artificial lab test on mice. And, it didn’t really use sauerkraut. Instead, it used “healthy bacteria” extracted from sauerkraut. So, the report has no meaning for human gout sufferers. It might suggest that we should do more research on probiotics in human gout sufferers. Now, we know that a healthy gut is good for gout sufferers. If probiotics help us excrete more uric acid through the gut, that’s a good thing. But, the evidence is very limited. I found 3 studies that investigated changes in uric acid levels after consuming probiotics. None of these “healthy bacteria” came from sauerkraut. More importantly, none of the studies involved gout sufferers. So, there is no general evidence that all gout sufferers will benefit from sauerkraut. But, individuals vary. Which is why I always emphasize that gout treatment must be personal. Is Sauerkraut Bad For Gout? So, if sauerkraut is not good for gout, is it bad? Not really! By which, I mean that it has no significant effect. And, sauerkraut can only be good for gout, when it is part of a healthy balanced diet. So, if you believe you can control your gout with better diet, you must start with a healthy diet. Then, you might be able to improve your diet by changing some foods for better ones. For example, extra sauerkraut in exchange for fewer potatoes would be good for your gout. 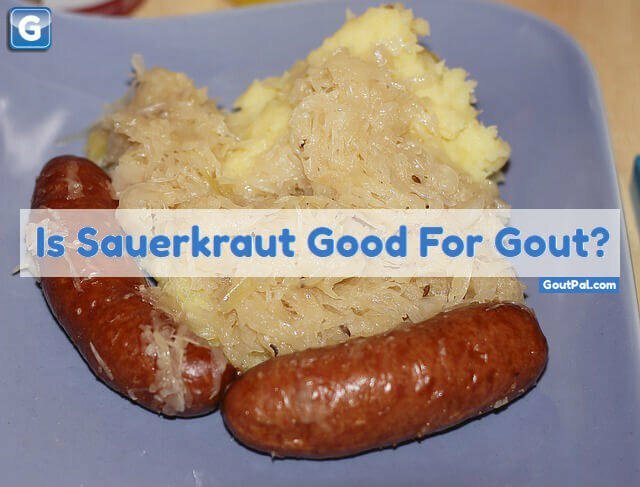 A portion of sauerkraut instead of one of your sausages would be even better for your gout. How will Sauerkraut affect Your Gout? I’ve explained that there is no strong link between sauerkraut and gout. But, I’ve also shown that some individuals might benefit. So, how can you tell if sauerkraut is good or bad for you? The starting point has to be a healthy diet. If you have an unhealthy diet, it is impossible to tell if sauerkraut is helping you. And, random changes to your sauerkraut intake will not tell you anything. So, the best thing is to learn to become a Gout Dieter. I can help you with that. Just ask in my gout forum. Sauerkraut and gout. It’s only good when it’s balanced. Li, Ming, et al. “Screening and characterization of purine nucleoside degrading lactic acid bacteria isolated from Chinese sauerkraut and evaluation of the serum uric acid lowering effect in hyperuricemic rats.” PloS one 9.9 (2014): e105577. Fabian, and Elmadfa. “The effect of daily consumption of probiotic and conventional yoghurt on oxidant and antioxidant parameters in plasma of young healthy women.” International journal for vitamin and nutrition research 77.2 (2007): 79-88. Asemi, Zatollah, et al. “Effects of synbiotic food consumption on metabolic status of diabetic patients: a double-blind randomized cross-over controlled clinical trial.” Clinical nutrition 33.2 (2014): 198-203. Ranganathan, Natarajan, et al. “Pilot study of probiotic dietary supplementation for promoting healthy kidney function in patients with chronic kidney disease.” Advances in therapy 27.9 (2010): 634-647.